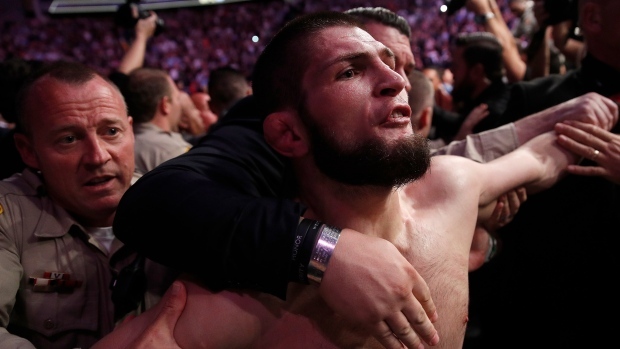 LAS VEGAS -- UFC fighters Khabib Nurmagomedov and Conor McGregor are being suspended by the Nevada Athletic Commission for a brawl that erupted inside and outside the octagon after their lightweight title fight last weekend in Las Vegas, an official said. McGregor's manager, Audie Attar at Paradigm Sports Management, did not immediately comment and Nurmagomedov's manager, Ali Abdelaziz at Dominance MMA Management, did not immediately respond to emails. Abdelaziz's telephone was not accepting messages. However, Nurmagomedov, who was praised by Russian President Vladimir Putin during a meeting Wednesday in Moscow, responded with an angry Instagram post saying he was being unfairly punished. Fighting erupted outside the octagon late Saturday, after McGregor (21-4) tapped out during a chokehold by Nurmagomedov (27-0) in the fourth round of UFC 229 at T-Mobile Arena.